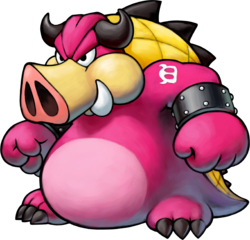 Midbus is a brawny, unintelligent, pig-like creature and a major antagonist in Mario & Luigi: Bowser's Inside Story and its remake. He acts as Fawful's chief minion. Akin to his master's tendency to speak in Engrish, Midbus speaks in broken sentences and gives unnecessarily long names to various weapons that he uses (for example, he refers to Junker as "Super Ultra Great Mega Trashy Monster Junker Bot"). His name is a pun on the phrase "mid boss", and he himself is fought by Bowser three times during the course of the game (the third time as Blizzard Midbus, his powered-up form). Midbus resembles a pink boar with an armadillo-esque armor. Midbus is similar to Bowser in build and temperament, making him a foil as well as a rival to the Koopa King. Midbus, during his first encounter with Bowser. After Bowser inhaling Mario Bros. and others and becoming unconscious in Princess Peach's Castle's Conference Hall, Fawful called Midbus to come, during which Midbus only makes a dialog box appearance. When Bowser meets Fawful in Cavi Cape, he sends Midbus to battle him. During the battle, Fawful unintentionally teaches Bowser how to use his action commands on Midbus. 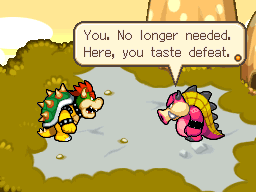 Due to the effects of the Vacuum Mushroom, Bowser ended up getting weakened, and Midbus and Fawful abandon him, but not before telling him that they plan to take over his castle. Later in the game, Fawful puts him in charge of Bowser's Castle, his now secondary base, along with Bowser's now brainwashed minions. When Bowser approaches the castle, Midbus makes it animate to attack him, as he lands the castle on top of him. Bowser then becomes giant thanks to Mario and Luigi. Midbus fights Super Bowser within his own castle. After being defeated, he accuses Bowser of cheating before retreating with the castle into a new area. He later drops an enormous iron ball on Bowser, but he is able to toss it back thanks to Mario and Luigi who help him in the Arm Center, therefore preventing the castle from moving any further. When Bowser reaches the castle, he realizes it has been completely changed by Fawful. Bowser finds out that he made a piece of his castle into a gigantic auditorium with a big stage at the end of it. Fawful is seen hosting some kind of show or act. When Bowser is about to fight Fawful, he sends Midbus to battle him again in a cage match. In this battle, Midbus attacks in various ways. One of Midbus' most prominent moves is his body slam move (which he also did at the beginning of the game in the tutorial, which was unavoidable). He will bounce three times on his belly, then jump into the air either directly above Bowser or a little to the side. If the former, Bowser must press so that Midbus will land on his spiky shell rather than his head. If the latter, he must punch Midbus away or make Midbus land on his arm or risk getting hit by the shockwave from Midbus' body slam. This move can confuse Bowser or flip him over for the latter. He can also go off-screen and grab a wrecking ball and return while swinging it rapidly. As Midbus approaches Bowser, he must duck and hold for three seconds, then Midbus will spin back, but before he stops, he will either have the wrecking ball raised up high or down low. If it is up high, Bowser must duck the attack, and if it is down low, Bowser must punch it away. This move can confuse the player. His last move is sucking up all his energy and then walking forward for a giant punch. Bowser must rapidly punch his belly to cancel his attack. He can also counter the second Midbus grabs his belly in pain, and hurt him with a punch. This move can trip Bowser. If he executes any of his moves correctly on Bowser, the audience will throw him coins (which are useless) and food which Midbus will eat to heal himself. The donuts heal 10 HP, the cakes heal 20 HP, and the meat heals 50 HP. Bowser can inhale the food to use himself which will do the exact thing, but meat boosts his attack power and heal 50 HP as well. If Bowser makes any of his moves end with an "Excellent" rating, Bowser will only receive 10 coins. After Bowser finally defeats Midbus, he is rewarded with a banquet feast. He gets overstuffed though and gets stuck in the floor shortly afterwards. Later in the game, Fawful and Midbus see Bowser stuck. Midbus then watches as Fawful begins to use a ray gun, the reason for doing so being to find the princess for part of his plan. He then increases the power on the ray, and eventually finds the princess. Fawful then stops firing the ray as a light emerges from Bowser's body, and the princess emerges on Fawful's shoulder. Midbus brings out a treadmill, which Bowser falls onto and uses to make himself normal-sized again. Before Bowser can fall on, though, the pair leaves, with Midbus ignoring Fawful's orders to help him carry the princess. In Princess Peach's Castle, Mario, Luigi and Starlow meet the pig for the first (and so far only) time. Midbus makes a trash monster to attack the Mario Bros. so they cannot pass to rescue Bowser who is knocked out. After Junker's defeat, he goes into another area of Princess Peach's Castle. Later in Peach's Castle, Bowser meets Midbus again in a room with a machine sucking Princess Peach's power into the Dark Star. Fawful powers Midbus up with his ray gun, and he becomes Blizzard Midbus, whom Bowser must fight to progress through his adventure. After Midbus is defeated for the third and final time, he gets frozen in an ice cube and endlessly starts spraying frozen mist from his nostrils. Bowser inhales this mist due to pain in his chest (owing to the Dark Star eating his DNA). The mist goes up the Airway, Mario and Luigi's next destination. Mario, Luigi, and Starlow must use this frozen environment to their advantage to get to the Dark Star. Midbus is always frozen in that room if visited. It is unknown what happened to Midbus after the events of the game, or if he even survived being frozen. He also appears in the game's remake with the same role as in the original, and also has a minor role alongside Fawful in Bowser Jr.'s Journey. At one point, he is insultingly referred to as slow by Dieter of the Best Fitness Friends, much to his chagrin. "You listen. Peach, gone. Lord Fawful, new ruler. Now, no need of you. Lord Fawful says sleep. NOW YOU SLEEP!" "MUH MUH! The clock strikes payback hour. Do plan two. To your posts!" "Bowser! Next time goes a different way than this way went." "Hmph. I scoff. I scoff at you. You bluff. It is time. The special weapon of Lord Fawful. I will release it. SUPER ULTRA WONDER ULTIMATE RUTHLESS GREAT IRON BALL! HYAH!" "You amuse me. I have fought Bowser. You are much smaller." "He is of trash. And you are. You, trash. I call you trash. Go be trashy in this trash hole with this trash robot forever!" "No one pressed "dance"! You are broken!" "Now it is time! Now we will fight! Then you will lose! And you will cry!" "But none beat Lord Fawful... And he will FINISH YOU!" Metabosu Metaboss; Pun of "metabo" (Japanese slang for metabolic syndrome) and "boss"
Spanish (NOA) Cervil Pun of "Cerdo" (Pig) and "Vil" (Vile). Pronounced the same way as "servil" (subservient). Bronehryak "Brone" is based on "Bronenosets" meaning "armadillo". Hryak is name for Boar. Pigs patterned after Midbus in Minecraft: Wii U Edition. Midbus is the only boss Bowser fights without any help from Mario and Luigi in the first and second battles. In Minecraft: Wii U Edition, there is a Super Mario Mash-Up Pack that replace skins in the game to characters/enemies from the Mario franchise. Unused screenshots in the files reveal Midbus skins were originally going to replace the Pig skins, but that was removed from the final version of the game. This page was last edited on April 6, 2019, at 17:54.